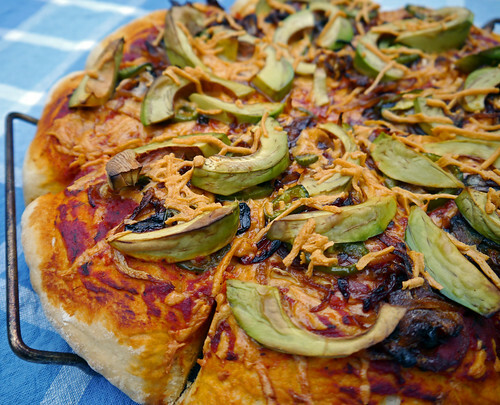 A vegan pizza from first-timer holeintheearth! winteralopex: Sometimes I make mint chocolate chip ice cream from scratch. Want the recipe? K! Posted: 11/17/12 at 9:47 am. Filed under: Saturday Garbage Plate. Alt title: Bruschetta Pizza, Redux! Prior to the first real, garden-annihilating frost, I was lucky enough to pick several grocery sacks worth of green tomatoes, which have slowly been ripening in the months since. (Hint: put them in a paper bag, along with a few apples, and wait for science to work its magic. Check in daily and remove any decomposing tomatoes.) I also scored a decent amount of ripe, red tomatoes, which I’ve been frantically trying to find uses for before they go bad. Basically what this means is that I’ve been making ridiculous amounts of pasta, pizza, and – yes! – bruschetta (which aren’t always mutually exclusive, mind you!). 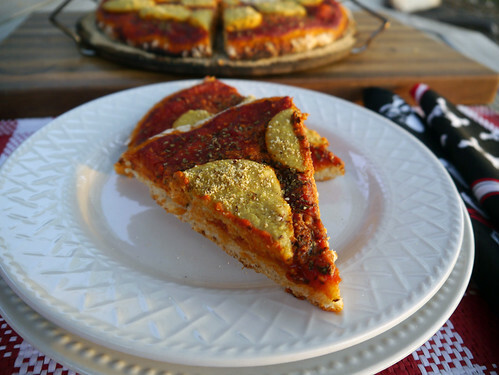 If you remember the Bruschetta Pizza recipe I shared a few months ago, good for you! You get a gold star! Kidding. All I have to give out is another pizza recipe. Even better, right? Anyway. Where was I? Oh yeah! : Bruschetta Pizza. Though the original version is relatively healthy – topped as it is with a dab of olive oil/balsamic vinegar, a little mozzarella Daiya cheese, and oodles and oodles of fresh tomatoes – I wanted to try a Bruschetta Pizza sans cheese, seeing as it’s expensive and nutritionally useless and occasionally hard to find in these parts. (I still love you Daiya!!!) Since the pizza would be too dry topped with just bruschetta, I replaced the cheese with red sauce and then made the pizza as I would normally. 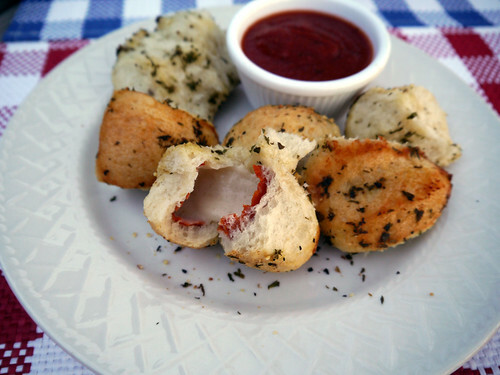 Delicious, though lacking some of the strong bruschetta taste of the original. On my second attempt, I mixed a bit of the “bruschetta juice” with the red sauce. Success! Still not as bruschetta-y as the original, but a nice balance between the two. 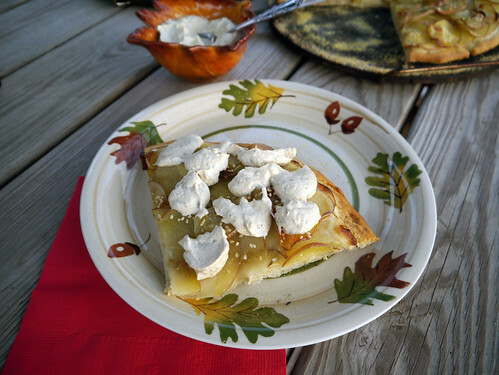 Make this one if you don’t have any cheese on hand, or just want to stay away from the stuff. 1. At least four hours before making the pizza, prepare the bruschetta. In a medium bowl, combine the fresh tomatoes, sun-dried tomatoes, basil, garlic, salt, olive oil, and balsamic vinegar. Mix well. Cover and chill. 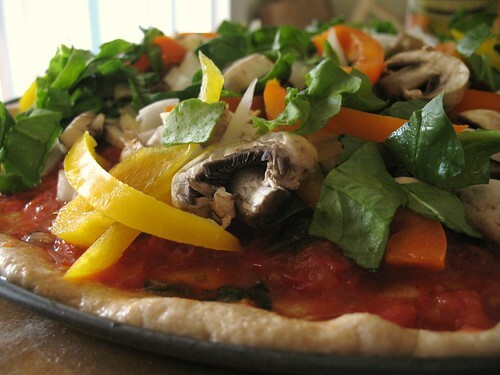 Remove from the fridge about a half hour before you begin assembling the pizza. 2. Several hours prior to making the pizza, prepare the dough. In a large bowl, combine the sugar, yeast, and water; mix until completely blended. Add the salt and olive oil and mix well. Add the flour in stages (about 1/2 cup at a time) and mix until the flour forms into dough. On a lightly floured surface, knead the dough by hand and shape into a ball. 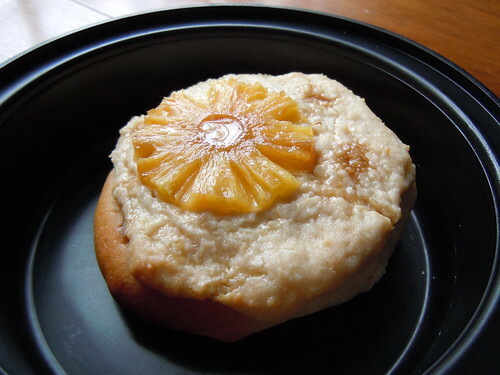 Cover loosely with a towel and leave the dough to rise, anywhere from 30 minutes to two hours. 3. When you’re ready to assemble and bake your pizza, preheat the oven to 425 degrees F.
4. To assemble the pizza, start by spreading a dusting of cornmeal onto your pizza stone (or lightly coat your pizza pan with cooking spray). 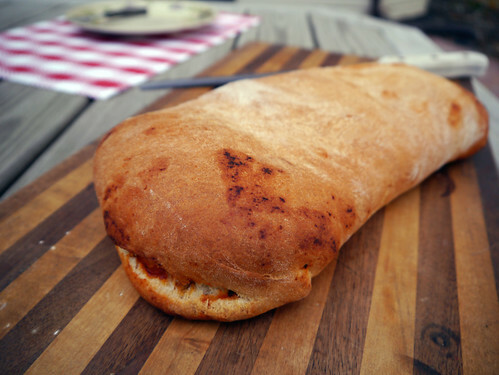 Using fingers dipped in olive oil (optional), pat the dough onto the stone, spreading it out evenly. 5. Carefully drain the liquid from the bowl of bruschetta; pour it into a bowl or mug. Add it to the red sauce, a teaspoon at a time, until the flavor is to your liking. (I used about a 4 teaspoons of bruschetta juice per cup of a red sauce; one cup of sauce just about covered the pizza.) When done, spread the red sauce evenly over the pie. Set any leftover bruschetta juice aside; if you have any bruschetta left, you can return it to its sauce! Optional: For a less brucshetta-y pie, just set the bruschetta juice aside and add the red sauce as is. 6. Top with some or all of the (drained) bruschetta. (The recipe above makes enough to cover a 13″ pizza.) Dust with a bit of vegan parmesan, if you’d like. 7. Bake at 425 degrees, for between 15 and 20 minutes for a single pizza, or 30 minutes for two pizzas. Enjoy! Posted: 11/12/12 at 12:21 pm. Filed under: Food & Recipes. JESUS TAKE THE WHEEL. Is this the most beautiful thing you’ve ever seen or what? Posted: 11/10/12 at 5:11 pm. Filed under: Saturday Garbage Plate. 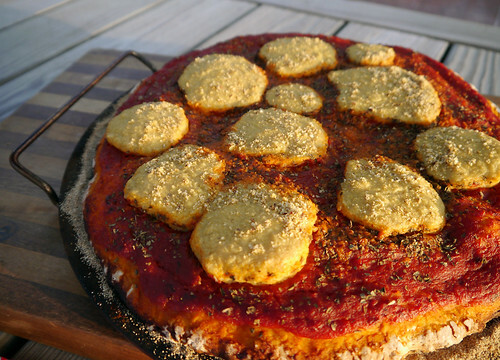 The Great Vegan MoFo Vegan Pizza Roundup! Non-vegans might have missed it, but October was the Vegan Month of Food (Vegan MoFo for short) – a month-long blog carnival during which bloggers pledge to write about vegan nomz every day (or at least during the weekdays! I logged 36 posts ’cause I’m an overachiever, but who’s counting?). This was the seventh annual VMF, and my sixth year participating. 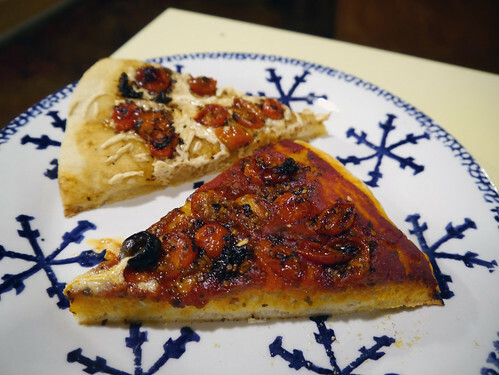 If you noticed a sad, sorry lack of new pizza recipes here, that’s because I was publishing them over on my personal blog. I meant to post some photos at least, just to keep y’all updated, but in all the chaos of daily blogging I never quite found the time. And so: a giant pizza roundup! My theme this year was “Eat to the Beat,” meals and desserts inspired by songs. Fertile ground for pizza, am I right people? 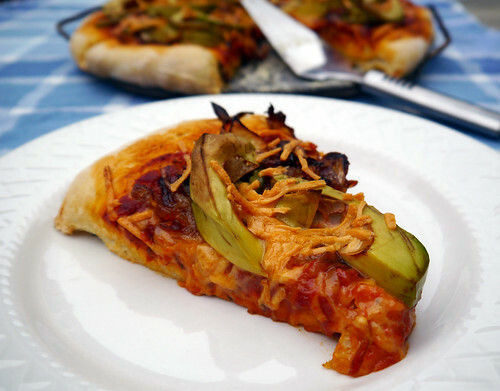 The first pizza was straight off the Blackbird Pizzeria menu: a Nacho Pizza with jalapenos, avocados, and cheddar Daiya cheese. I’ve never had the pleasure of dining at Blackbird – or any all-vegan pizzeria, for that matter! – but I think we nailed the look and taste. As with most of the pizzas pictured here, I have a recipe to share! Paired with “Blackbird” by The Beatles, if only because it provided a handy excuse to make pizza! 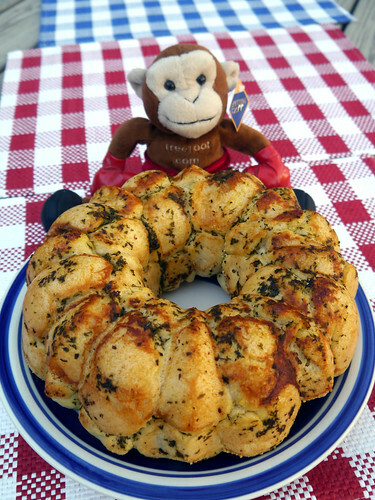 Next up is my own personal favorite, Pepperoni Pizza Monkey Bread. 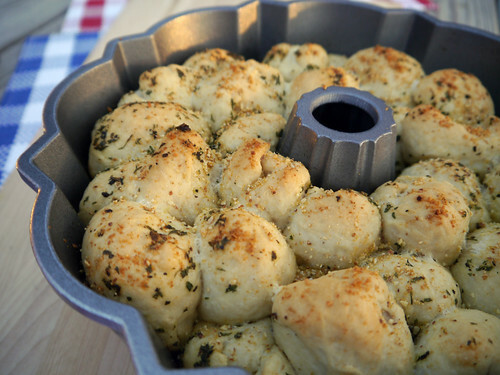 Basically what we’ve got here are ~48 (give or take) little pizza bites, stuffed with Follow Your Heart cheese and Lightlife pepperoni, coated with margarine and assorted spices, and then baked together to make one ginormous, coffee cake-shaped, pull-apart pizza. Fancy, right? Don’t let its gorgeous neon hues and seductively lumpy bits fool you, it’s ridiculously simple to make. A little tedious, but worth it. Click through for the recipe, mkay? Photographed with the Tree Loot monkey ’cause he’s adorable. You two can share a pizza while singing along to the theme song from The Monkees. So much retro win right here. One of the Iron Chef challenges featured two ingredients that I knew I could easily make into a pizza: potatoes and sesame seeds. Behold: Rosemary Potato Pizza with a Garlic Sesame Sauce! 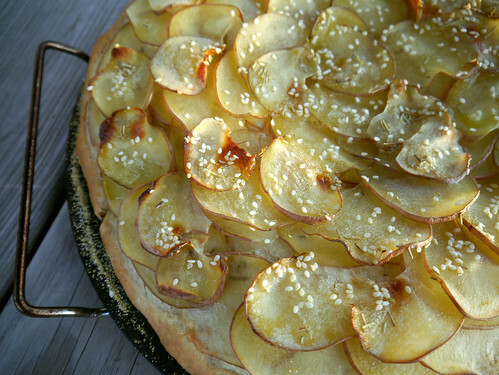 This is a rather simple potato pizza on a rosemary crust and topped with a sprinkling of sesame seeds; the real star of the show is the dipping sauce. Basically it’s just homemade vegan mayo seasoned with sesame oil where plain old olive oil would usually be. So good though, and it adds a little extra moisture to what can sometimes be a dry pizza. Apologies in advance for the tunes: “Gimme Pizza” (Slow Jam) by Mary-Kate and Ashley Olsen. This was an impromptu post, so cut me some slack. Enjoy with Ghost Mice. Free Pizza for Life, yo! Close on the heels of Vegan MoFo was the Virtual Vegan Potluck. It’s held twice a year, usually in May and November, the November date scheduled to coincide with World Vegan Day. This was my first time participating, and I signed up to bring bread. Specifically, Hot Cross Buns and Pepperoni Pizza Bread – something sweet and something savory to satisfy everyone’s palates! 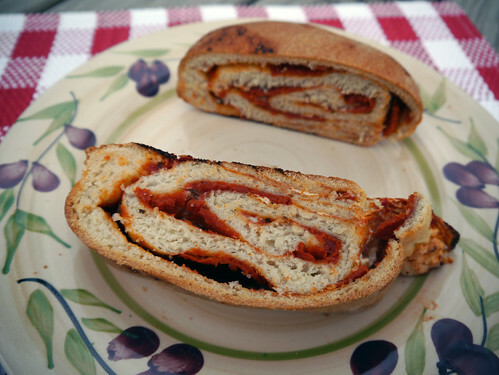 The pizza bread is deceptively easy to make: you just roll the dough out into a rectangular shape, add the toppings, roll or fold, and bake! You can use any toppings, but we kept it basic with red sauce, mozzarella Daiya cheese, and Lightlife Pepperoni. But just in case you’re still intimidated, I have a recipe! Next week we’ll resume our regularly scheduled pizza blogging. Until then, make some pizza bread and stuff it. IN YOUR FACE. Posted: 11/5/12 at 3:58 pm. Filed under: Food & Recipes. A Vegan day Pizza with vegan feta, avocados, garlic, and tomatoes. CC image via flickr user juliarowe. reblogged from thalamuslyincorrect: And there you have it! Delicious heaven. Posted: 11/3/12 at 1:59 pm. Filed under: Saturday Garbage Plate.